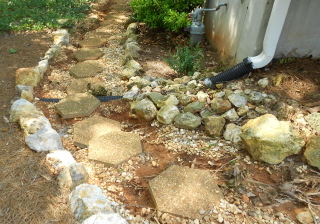 Erosion control for washed out stepping stones – Johntheplantman's stories, musings, and gardening. I looked up the hill at the road and saw that a lot of water was coming from that area. I then studied the grassy area to see if the water could be re directed. I decided that a berm (a modified hill) would be an effective way to change the water flow to an ivy covered area in a natural area. I painted lines on the grass following the hillside to get a picture of where the berm should be in order to direct the water to a desired location. 3. Provide protection for the repaired surface to prevent further erosion. We started working on the project by changing the water flow one step at the time. 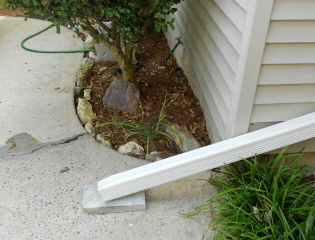 The first and easiest step was to change the downspout so that the water would go under the eroded steps. This proved to be even easier than I thought because the pipe from the poorly installed catch basin was already in the ground. 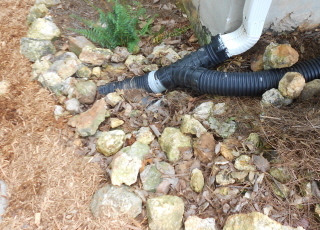 I took the extension off of the downspout, added a vertical extension and an elbow, and then ran the pipe. The pipes would be connected with a four inch black wye. 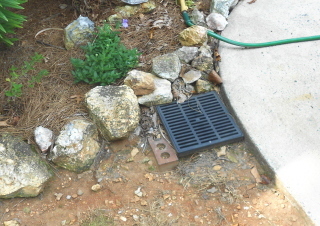 We removed the existing catch basin and installed a three foot drain at the edge of the drive. This drain was connected to the existing pipe from the removed catch basin. The drain has been carefully cemented in so that water will flow straight to it. We mortared in a back border of rocks to stop any water that might jump the drain. 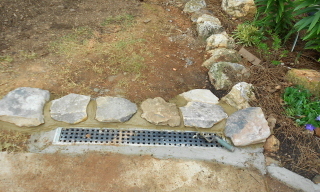 The stepping stones were raised and reset using cement. We decided to keep them level instead of sloping down the hill and they came out more like steps then a pathway. I found the look rather pleasing. 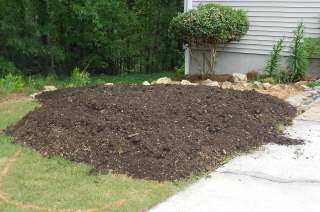 We dumped about six cubic yards of compost to form a small hill (berm) inside the orange line that I had painted. In case you look at the picture and wonder, I had decided to modify the orange line. 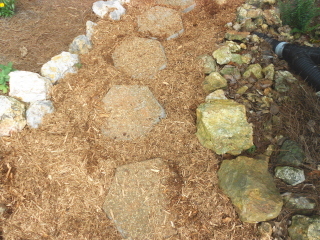 We will open up the rock border of the bed below, using the rocks to line the edge of the berm. The water will be diverted down through a dry river bed to the ivy below. We next raked out the berm, moved some rocks around and filled in the pathway to the stepping stones with shredded cypress mulch. We tied in the downspouts to the pipe running under the stepping stones. 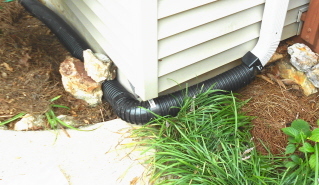 Downspouts put out a lot of water and should always be taken into consideration. 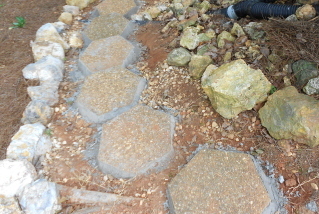 We used cypress mulch to finish off the sides of the stepping stones both for aesthetic reasons and to stop any erosion that might be caused from direct rain. I have found that cypress mulch is much better than bark in these situations because it tangles with itself and doesn’t wash out. 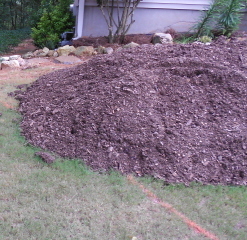 The berm is raked out and only needs a rock border. 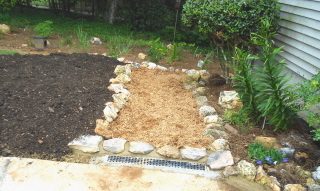 My client on this job, Ann, is an accomplished gardener and wishes to lay the rock and the dry river bed (dry creek bed? Which is best?) on her own. 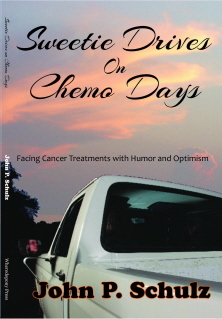 She also has ideas about plants for the berm which I am waiting to see. 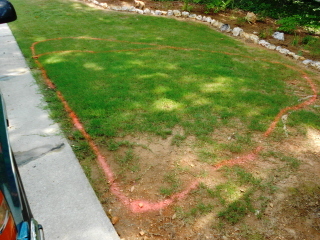 The planted berm will add a much needed foliar anchor to that side of the house. I think berms are way cool and fun to work with. 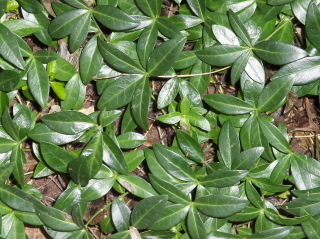 I am going to suggest that vinca minor should be planted down the sides of the stepping stones. This is a rather tame vining plant that will grow in and help to prevent further water damage. Tree forming-Landscaping from the inside out.